Tank - revue internationale de l'art vivant (1927-28), published by Ferdinand Delak in Ljubljana and edited by him and Avgust Černigoj. Two multilingual issues were published, third banned. 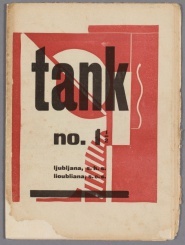 Tank 1 1/2 (1927), 64 pages. Download (55 mb). 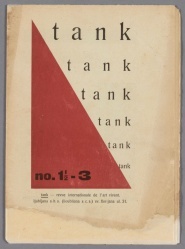 Tank 1 1/2 - 3 (1928), 48 pages. Download (42 mb). The above PDFs are sourced from Bibliothèque Kandinsky. This page was last modified on 10 September 2014, at 13:18. This page has been accessed 6,823 times.